Enslow's new series, Life–A How-to Guide is a 7-book series for teens about a variety of issues that they face in their everyday lives. Whether you have a teen who is getting ready to driving or driving already, our Getting Read to Drive: A How-to Guide is great for research or personal use. Driving can play a pivotal role in a young person's life. It represents freedom but it also requires responsibility. From deciding if you're ready to drive, to the rules and safety, this book is a comprehensive guide for young drivers and their parents. Technology has become so integrated into the life of today’s teenager that it is changing the way the American family communicates. That's why we felt that Using Technology: A How-to Guide was an important book to include in this series. From cell phone etiquette, to texting, playing games, and listening to music, this title explores different forms of technology and how it affects our lives, and most importantly, how kids can stay safe using it. Looking at the list of classic titles on the banned books list, John Steinbeck has written The Grapes of Wrath and Of Mice and Men. One of the main reasons Steinbeck's books are on the Banned Books list is because of their use of obscene language. Racism, sexuality, and other issues play a part, but obscene language is the recurring theme. Enslow's Authors of Banned Books series includes titles on Mark Twain, Robert Cormier, Madeleine L'Engle, J.K. Rowling, and John Steinbeck. These titles include arguments of those opposed to these books and arguments of the books' supporters to help readers decide for themselves whether they should be banned. September 23rd is the First Day of Fall! Are You Ready for the Fall Colors? Fall is here, and with the change of the season, Fall Colors are starting to show up all around us. It's a great time to teach your preschooler to read the words associated with Fall, and our new book, Fall Colors, makes this a fun and engaging experience for new readers. With vivid photographs, detailed illustrations, and large, crisp type, Fall Colors is sure to get your child's attention. 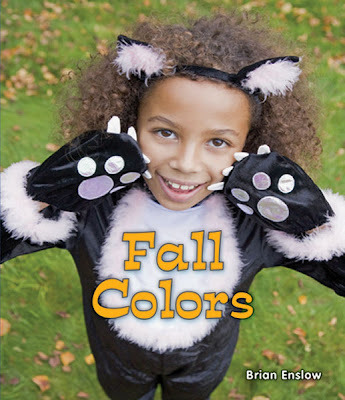 Fall Colors is one book in our "All About the Colors of the Seasons" series, written entirely by our very own Brian Enslow. All books in the series are available in both paperback and library binding and are Guided Reading Level B. Young readers delight in discovering spying's concealed arts and unpublicized actions. New titles on the subject are often among a library's most popular choices, especially among "reluctant readers." Bringing a fresh perspective to the subject, Enslow Publishers's new series "The Secret World of Spies" examines this intriguing world, from its human "assets" to technology even Jason Bourne in The Bourne Identity could not have imagined. Author Susan K. Mitchell's Guided Reading Level "Q" text brings a lively point of view to this engaging subject. Each 48-page book includes excellent design support, including useful "pull-outs". Fun illustrations help bring alive an elliptical world often shrouded in mystery and misinformation. Back-to-school time is a great time to talk to teens about volunteering. Many schools now require a certain number of volunteer hours to graduate, others strongly encourage it by offering a wide variety of after-school programs that students can participate in. Whether young adults volunteer through their school or another organization, they are very likely to benefit from the experience. Volunteering can be very rewarding and in some cases it may help students decide what they want to do later in life. Enslow's new title, Volunteering: A How-to Guide, offers inspiring true stories of teens who volunteer. And while these teens may already know what issues they are passionate about, the choice is not always obvious. Included in this book is a quick quiz students can take to help them figure out what issues they may like to help with. There is also a great list of volunteer and services resources provided making it easy for teens to start volunteering. This September marks the 95th birthday of the late British author. Some of his more famous works are Charlie and The Chocolate Factory, Fantastic Mr. Fox, and James and the Giant Peach. In fact it’s the 50th anniversary of James and the Giant Peach. A great way to learn more about this gifted storyteller is with Enslow’s title, Roald Dahl, part of the Author’s Teens Love series. Titles in this series are for an interest level of grades six and up and feature insightful quotes by and about each author. Learn more about one of the world's best-selling authors! Can you imagine flying through the center of a hurricane? That is what hurricane scientists do. They use aircraft to fly into the eye of a hurricane, measuring the speed, direction, temperature, pressure, and humidity of the winds on either side of the eye. Several passes are made from one side of the storm to the other at different heights to get an idea as to the strength of the winds. As we are well aware on the East Coast, hurricanes can dump a lot of rain as they progress. The difference between a hurricane and a tropical storm is the speed of its winds. Once winds reach 74 miles per hour, the storm becomes classified as a hurricane. By the way, the word "hurricane" comes from Hurican, the name of a mythical Caribbean god of evil. Interested in learning more about hurricanes and other storms? Check out Storm Scientist by Timothy Gaffney. Today is National Video Game Day! ﻿ One day, a television engineer named Ralph Baer began to wonder whether our TVs would be able to play games with us. His experiments led to the development of the first video game console, marketed by Magnavox as Odyssey. Honored by President George W. Bush as the father of video games, Baer is still at work developing new ideas. Part of the "Genius at Work! Great Inventor Biographies", other titles in this elementary series include biographies on W. K. Kellogg, Les Paul, George Ferris, Igor Sikorsky, Vivien Thomas, James Naismith, Stephanie Kwolek, and more! things you are, so they understand what you are going through. feel less alone and less vulnerable. Enslow's new title Friendship: A How-to Guide has arrived just in time for students heading back to school. Many students may be facing a new community, a new school, or even just new people in their classes. This how-to guide will help young adults learn about different types of friendships, cliques, making new friends, and it even gives advice about bullying. The United Nations Educational, Scientific and Cultural Organization (UNESCO) recognizes International Literacy Day today, September the 8th, and this year the focus is on literacy and peace. The purpose of the day is to raise people’s awareness of literacy issues in the world. One great way to recognize literacy throughout different cultures is by reading Enslow’s new titles in our Mythology Rocks series. Since myths are stories of a people, they appear all over the world-telling narratives of their unique cultures. They were first told orally and then eventually written down so different cultures could read about their history-thus promoting literacy worldwide! African Mythology Rocks!, Celtic Mythology Rocks!, Chinese Mythology Rocks!, Gods and Goddesses in Greek Mythology Rock!, Heroes in Greek Mythology Rock!, and Maya and Aztec Mythology Rocks! are all new titles in this series for the fall. Each library bound title is $31.93, at an interest level of grades six and up. Check out these titles and see how literacy advanced internationally! Labor day is a time to get ready to return to school. Some schools have already started. Here's a book about the history of schools and what they might look like in the future. This title is part of the "Imagining the Future" series. One hundred years ago, some kids traveled to school on horseback. One hundred years from today, they may get there in buses that fly! Author Linda Bozzo shows young readers how the schools of the past looked and encourages them to think about change over time and what schools may be like in the future. Uses vintage historical photos and colorful, humorous drawings to encourage young imaginations! The recent earthquake...stressful. Hurricane Irene...stressful. No power...stressful. But adults are not the only ones dealing with stress right now. Ahhhhh! Going back to school for students can be very stressful. Juggling homework, sports, jobs, and whatever else life throws at them can make them feel overwhelmed. Most young adults do not yet have the tools to deal with stress. That's where our new title, Dealing with Stress: A How-to-Guide, can be helpful. Students will learn the effects stress has on the body, the different types of stress (not all stress is bad), coping skills, and how to manage stress along with links to additional resources such as Teen Help. This title not only contains great information for students but I would recommend parents reading it as well. There's some great tips for everyone but as a parent of a teenage daughter, it was helpful in explaining stress from a teen's perspective so I can be more sensitive to what she's going through at this time in her life. Afterall, it's been a while and the world has changed drastically since I was a teen. Counselors will benefit as well from having this book on their shelves to share with their students and parents. Enslow Publishers wishes everyone a safe and stress-free holiday weekend. Enjoy!